On Tuesday, 400 alumni of the Department of Justice announced their disapproval of acting Attorney General, Matthew Whitaker, calling for him to resign. 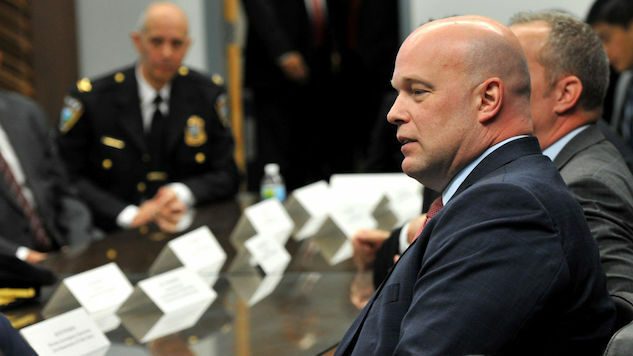 The government watchdog group Protect Democracy gathered signatures from these DOJ vets and compiled them in a Medium post, where signees on both sides of the aisle are still throwing their hats in the ring, declaring that Whitaker was brought on unconstitutionally and that Trump must appoint a new AG in accordance with the law. On Nov. 7, when former Attorney General Jeff Sessions was pushed out of the job, Trump tapped Sessions’ then-chief of staff, Whitaker. Typically, the job goes to a second-in-command. Following the line of succession, that would’ve been Deputy Attorney General Rod Rosenstein, but this administration can’t do anything by the book. When Trump picked Whitaker over Rosenstein, he invoked the Federal Vacancies Reform Act of 1998, circumventing the checks and balances that are meant to stop a president from picking anyone they want. Even under the FVRA, though, that candidate is still subject to senate confirmation. Whitaker never went through that confirmation, nor was he subject to a public review of his qualifications. He was in the job before anyone had a chance to second-guess his appointment, which, more than likely, was part of Trump’s plan. Whitaker has publicly stated that he’s an opponent of Robert Mueller’s ever-lurking Russia investigation and, as attorney general, he can act on that bias. When Mueller goes to file his end-all report, it’s going to have to pass Whitaker’s desk for approval. Mr. Whitaker has not been confirmed by the Senate, his qualifications to be the nation’s chief law enforcement officer have not been publicly reviewed, and he has not been fully vetted for any potential conflicts of interest. While we know that there are thousands of dedicated public servants now at the Department who will do their utmost to protect its mission and reputation, it falls to all of us to ensure that the Department’s role in maintaining the rule of law is not undermined or tainted. We therefore call on the President to follow the Constitutional process by nominating an Attorney General, and replacing Mr. Whitaker as Acting Attorney General with the Senate-confirmed official who is next in the line of succession by operation of federal law. We likewise call on the Senate to insist that its Constitutional prerogative to provide advice and consent be respected. At this point in time, there are legal challenges against the acting attorney general’s appointment and this petition calls for the president to appoint a new candidate to go through the proper channels. Keep an eye on the signatures and read the full statement from DOJ alumni via Medium here.